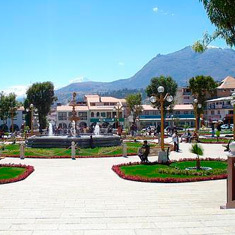 Huaraz is the capital of the Ancash region, situated at 3,100m above sea level in the valley of the Rio Santa. It is located 400 kilometers northwest of Lima, at the headwaters of the Callejón de Huaylas, a great valley between the Cordillera Blanca and Negra. Huaraz is the primray destination in Peru (and possibly South America), for mountaineering, hiking and trekking. This resilient city has been destroyed several times by violent earthquakes, however, maintains exceptional beauty that continues to attract trvelers to the region. It is sustained by two primary economic activities: tourism and mining. The mountains offer a wide range of tourist options, the most obvious being glaciated peaks exceeding 6,000 meters. The region is densely populated by glacial lakes and hot springs. The flora and fauna here are extraordinary, such as the Puya Raymondi, the world's largest flower (over 10 meters high), and the Andean Condor one of the largest birds on earth. The most popular paved road extends 400 km from Lima, passing the tip of Pativilca Conococha to 4000m, from south to north. There is also a partially paved road from Casma from Punta Callan which reaches up to 4200m. The dirt road from Chimbote to Huaraz/Caraz smoothly climbs up to 3000m without abrupt climate changes. Jorge Chavez Airport connects Lima and Huaraz by way of a 30 minute flight into the town of Anta's “German Arias Graziani” airport, which is 20 minutes drive on paved road from Huaraz. The best time for hiking or climbing is the Peruvian dry season, during June, July and August. May and September are also enjoable, but you have to be prepared for occasional rain showers.